A few small updates in the last two weeks. The player profile now shows some basic information about Blue Max. The number of games they are playing and have finished is shown and the number of turns they have submitted over the last thirty days. The number of moves they have made is dependent on the number of games they were playing at the time. The consistency with which they submit moves is probably a more important metric. For example at the time of writing I have submitted moves for Blue Max for 29 of the last 30 days. That makes me a pretty reliable player. The player profile is also slowly extending its reach into more parts of the site. Last week Arts Cow had at-shirt sale and Friendless asked me if I was going to take the opportunity to make some Hexcell shirts. That idea burrowed into my mind like a meme maggot and I started looking at how I could do merchandise for the site. Arts Cow has good prices and products (playing cards) but they do not allow you to set up a store. So I went looking other places that would take care of fulfilment. I found CafePress and Printfection. They both do t-shirts and more. Now I am tossing up which would be better. CafePress has more products types but their free store restricts me to having only one variation of each. So I can have one white t-shirt and one black t-shirt, but not two white t-shirts. CafePress does not allow much in the way of customising a store and there are some store features I do not want and cannot seem to turn off – I do not want a user newsletter managed through CafePress. Printfection allows many designs using the same product and their store fronts are highly customizable. 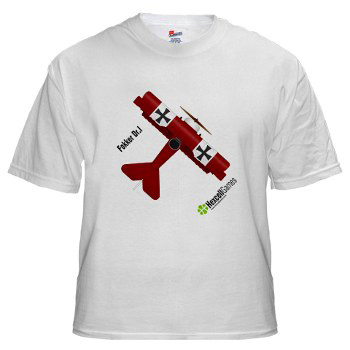 They do not offer as wide a range of products as CafePress and their back-end is much less intuitive. Price-wise both of them come in at around the same price, though Printfection’s refusal to allow me to choose a currency is annoying. Does anyone have experience with one or both of these providers and wants to share? Is anyone interested in Hexcell, Blue Max and Deduce or Die! t-shirts? Or should I just stop phutzing around and get on with development? I’ve used CafePress for several years to create stuff for online gaming con’s I’ve organized and been happy with the goods and service. It’s simple and easy to use, so has worked fine for me. I might be interested in a shirt, but it would depend on price, whether I could pick which aircraft design went on it (a Blue Max medal design would be nice too) and choice of color (not really a big fan of white). I’m not much interested in other products. OK, so that is one vote for CafePress. Thanks Mark. Price is somewhat out of my control – its whatever CafePress or Printfection charge plus an extremely modest markup. I did some testing and both services come out within a couple of dollars of each other. CafePress offers postcards, which would be perfect for the business card aircraft miniatures I mentioned elsewhere in this blog. Of course I would buy one, but I have no preferences as to colour or design. The picture here looks pretty nice.